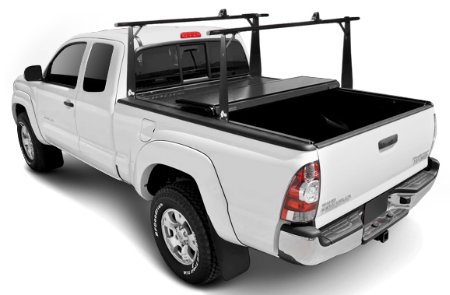 The BakFlip CS (Contractor Series) hard folding truck bed cover and sliding rack system is the absolute perfect product for contractors, sports enthusiast or anyone looking for a tonneau cover and a rack at the same time. Whether you're a plumber or a surfer, an electrician or a kayaker, the BakFlip CS is designed to give you the ultimate functionality and security of a great tonneau cover and an extremely well made rack. The rack system itself integrates into the BakFlip rails and can slide up and down with the simple twist of an included T-key. Locking the rack down after sliding it to any desired position is just as easy. The rack uprights easily slide off for time when you want a clean looking ride, or can simply slide all the way forward and be kept neatly behind your cab. The BakFlip tonneau cover provides ultimate security, but folds open just as easily whenever you need full access to your truck. The CS rack is designed to handle 500 lbs. of weight and the BakFlip can handle almost as much evenly distributed weight on top of it. Included in the BakFlip CS tonneau cover system are sliding tie downs for your rails and sliding load locks to grip ladders, lumber etc. Rack Weight Rating: 500 LBS. The BAKFlip CS® (Contractor Series) Model incorporates the revolutionary BAKRak System. Aluminum construction provides strength and rigidity while being lightweight and corrosive resistant. Low profile mounting rails with tracks incorporated into the outer side of each rail, look like original equipment and are inconspicuous when not in use. The modular system allows quick and easy changes to and from accessories and pods. Integrated T-Slot design in the rails allows for easy installation and removal of racks and all accessories while concealing mounting hardware. 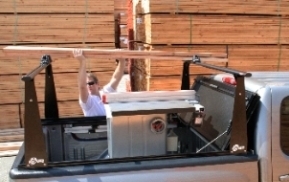 The unique extrusion profile provides for a 300 pound load capacity. Rails and racks are painted with black powder coat finish for added durability. The BAKRak system is rugged, aerodynamically designed, and an infinitely adjustable solution to your cargo needs. From lumber to boats, skis, and bikes, this is the last rack system you will ever need to buy. The crossbars are designed with a unique profile extruded from Aluminum 6063 grade alloy and then powder coated. Uprights are 409 grade stainless steel and also powder coated. These units are designed to match the contours and lines of the vehicle to give a clean, professional, and finished look. Double the storage capacity and utility of your truck today! Contractor Series Special Rails with T-Slot Design for Easy installation and removal of BAKRak. NOTE: What is shown above is a set of 4 "Load Stops" for the Top Cross Bars - This is available as a set of 4 for $139.00 (w/ free shipping) as an additional accessory. To order the "Load Stops", simply call our toll free 1-888-377-2268 to add to your order.